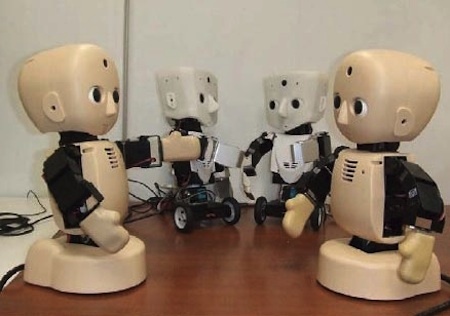 M3-neony and M3-synchy are robot babies under development by JST ERATO, in collaboration with Osaka University. "M3" is short for "man-made man", a reference to their humanoid shape. M3-neony has been developed to research the development of fine motor skills like crawling. In particular, it is hoped that M3-neony will help elucidate the processes by which human beings develop their own physical skills from earliest childhood. Remarkably, it weighs just 7.7 pounds, about the same as a human newborn. 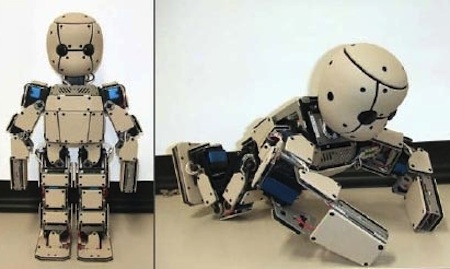 The main focus is on facial expressions and arm gestures, so it is an upper body robot only, with 17 DOF (2 eyes x3, neck x3, waist x2, 2 arms x3), measuring 30cm (12″) tall and weighing 2.5kg (5.5 lbs). The head is equipped with a single wide-angle lens CCD camera, two microphones, a speaker, and 15 LEDs which cause the robot to blush bright red. Combined with object recognition, speech recognition, and speech synthesis, the robot will be able to communicate in a variety of ways. I don't think I can specifically think of a robot baby in science fiction. A small child, though, you can find in Brian Aldiss' 1967 short story Supertoys Last All Summer Long. Via ; thanks to the anonymous reader who suggested it.